My daughter's friend's mother had surgery recently. I stitched together this quilt, using the Splash pattern. I've been cleaning out the sewing room, and I found a bucket of 2 1/2 x 4 1/2 inch rectangles. I decided to add them to my backings. I also have a bucket full of leftover binding strips, so the binding is all from scrap, too. I really like this scrappy little quilt. I want a job where I can be wrong 99% of the time, maybe something in the weather-predicting field? Today's forecast: morning rains may turn to slushy snow in the late afternoon. Total accumulation 3-6 inches. Apparently at my house, rain is white and fluffy and stacked 2-inches high so far. It's gonna be a long day. I added some super-bright nine-patches! (See, I don't only make brown quilts.) I have more applique and more piecing to do, but I also have some wonderful ideas for the border. "So, how does this work?" I said, "Well, you see, you give me a grandbaby, and I give you this quilt." Simple, right? He gave me that look that only adult sons can give their mothers and said slowly, "But the flower blocks are bigger than the other blocks. How do they fit together?" I proceeded to explain that when you applique, it's a good idea to make the background square a little larger and then trim it down when you are done. I just hadn't done that yet. I ended the conversation with, "But I was serious about that grandbaby." I made another darling apron, this time as a sample for my local shop. It added my first yardage for the year, but I used it all, so I broke even. A dear friend of mine has eight children. Yes, I said eight. Laundry is a huge issue for her family of ten and this woman irons all of those clothes. I am every bit as shocked as you are! I did not know that irons worked on clothing; I thought they were only meant for use on quilts. I guess you learn something new every day, right? It seems that every year or so my iron and I begin to have a disagreement. Usually the disagreement starts with my iron yelling, "My water reservoir has cracked because you dropped me on the hard floor one too many times so now I am going to squirt water everywhere." I'll usually shout back, "Dang! It's time to buy a new iron. Again." The current disagreement is somewhat different. For the past few weeks we've been playing the "If you want me to work, you have to jiggle the cord" game, progressing to the "You now have to jiggle the cord and wrap it around the handle twice and maybe I'll work" game, ending with the "I am going to pretend to work, but as soon as you pick me up I am going to flash an error message at you" game. Yes, really. An error message on my iron. C'mon Black & Decker, it's an iron for Pete's sake. I was recently homebound for two weeks with whatever plague my teacher-son brought home this month and I could not get to the store. My husband tried to buy me an iron (I know, sweet, right? He must have been really tired of hearing me complain because trust me, I complained about this stupid iron), but he left the store in confusion. The first time I mustered enough energy to drive a car, I went to the WalMart* to look for an iron. I have spent well into four-figures on irons and the game is the same for me whether it's a $30 iron or a $200 iron. With a child in college I am choosing the $30 irons, hence the trip to the WalMart. I looked over each iron trying to make a decision, but my energy was quickly waning. In desperation I grabbed the cheapest iron that they had, under $7 I believe, and hoped that it would buy me a week or two until I was well enough to shop for a proper iron. Today was new iron's maiden voyage and it's not bad! It is a little drippy, but the water is clear. I wonder how long it will be before this iron and I will start to have our disagreement. I will keep you posted. Yes, but can he dance? Many of you know that I don't watch television. As in, "we finally have cable but I still don't now how to turn on the television set." I watch television series DVDs when I can get them from the library and I occasionally watch hulu. Even though I, according to one family member, live under a rock, I've heard of the television show House, MD. Hugh Laurie is a well-known television actor. He was also the voice of Dr. Cockroach in Monsters vs Aliens. 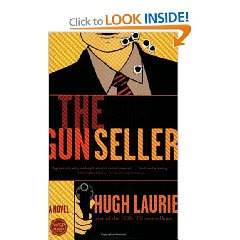 What I did not know, and what you may not know either, is that Hugh Laurie is a novelist. I checked his book out of the library and absolutely fell. in. love. It is an incredibly witty spy novel; every minute I spent not finishing that book was pure torture. Over 95% of the books that I read are audiobooks. This book was actually made of paper. If I had my choice, this would have been available on audio book, with Hugh Laurie reading it himself. Even without getting my own way, I enjoyed my time immeasurably. I've heard rumors that Mr. Laurie has a forthcoming book. Please, oh please, let them be true! Stash used this year: 59 yards! I would tell you that the yellow was a design choice, but the truth is that I used every. single. inch. of the turquoise fabric and it still wasn't large enough for the quilt. Quilts that are 72x80 are difficult to back!!!! And we love having her at our house! Last weekend my husband and I were supposed to be on vacation in Washington, DC. We cancelled a week before, just because the thought of going away was stressful. Then I got sick. We felt kind of smart for cancelling our trip, since I wouldn't have been able to go anyway. Then Washington, DC got hit with a paralyzing snowstorm and we felt positively brilliant for cancelling our plans! The snow has caught up with us, however, and we are home today expecting 8-12 inches of snow. It's not a huge deal, and snow days are fun even for grownups! I am still working, but not a full-speed today. If you have some spare time, like I do, check out Quilter blogs. It's a wealth of quilty information! Warning: only do this if you have spare time. You could spend hours and hours looking at all of the great blogs. The brown blocks from last week were pieced into a quilt top during the Super Bowl. I added some applique flower blocks that I recently unearthed while excavating my sewing room. I think they are too cute to let lie and will probably make more. The pattern is from Open a Can of Worms by Debbie Caffrey. I think I cut enough strips to make another quilt top, so you just might see another one of these sometime soon. Or next year. Maybe the year after that. For about a week now, I've been considering getting sick. My son is sick. My husband is sick -- I can't imagine why. It looks like fun. Some days I thought about giving in, and other days I decided I was too busy to be sick just now. This morning, however, I woke up and made a decision: I am sick. Send tea and toast and Tylenol and tissues if you like. I'll let you know when I decide to feel better. Similar to last week, but I added a few strips of miniature Seminole piecing. There are more pieces in each of those strips than there were in my last 4 quilts! Please notice that although the strips are mostly brown, there is some green in there. I'm gradually working my way up to color.